Winter steelhead have a reputation for being difficult for fly anglers. The winter weather and water conditions, as well as sexually developed fish, create some of the most demanding conditions that the angler will encounter all year. 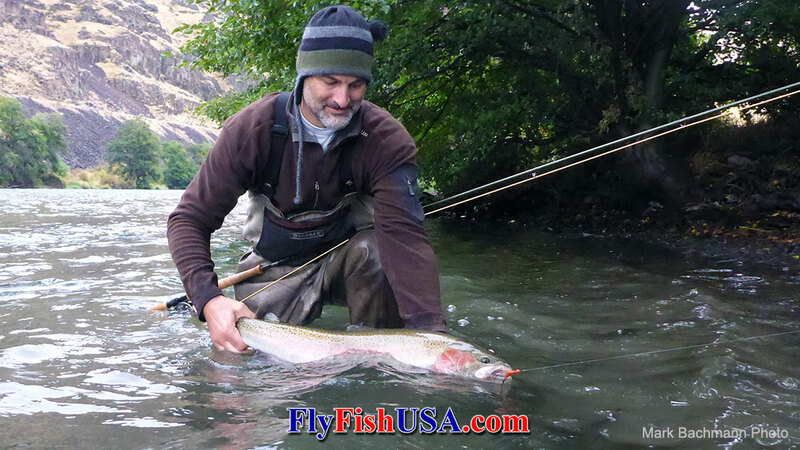 Winter steelhead are most often bottom hugging denizens of cold, often rain swollen rivers. Sometimes it is very difficult to present the fly at the depth where the fish are holding. 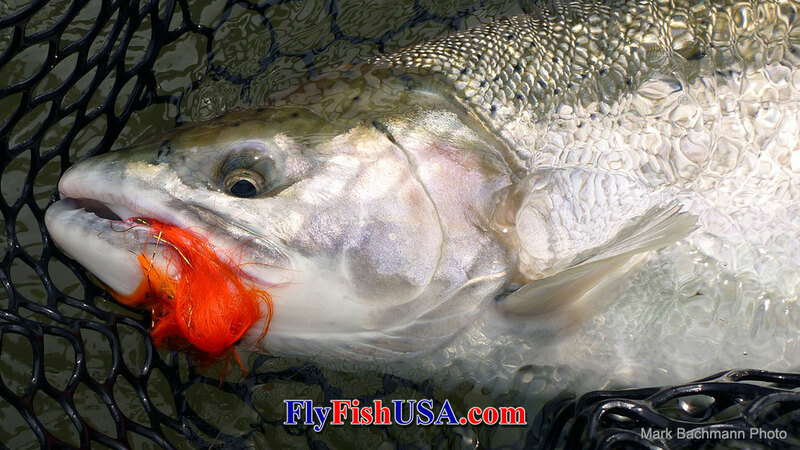 A sinking tip fly line is most often used to present the fly at the right depth. Often large expanses of water must be covered to find a fish that will bite. Flies that are easy to cast are essential in this game. Flies that cast small, but fish large are ideal. My favorite winter steelhead flies are made from soft flowing material that collapses when pulled from the water and puffs up when submerged. Marabou, Ostrich and rabbit strip are often key components on my fly tying bench. These materials breath with life when submerged. Marabou drains out almost instantly when it leaves the water. 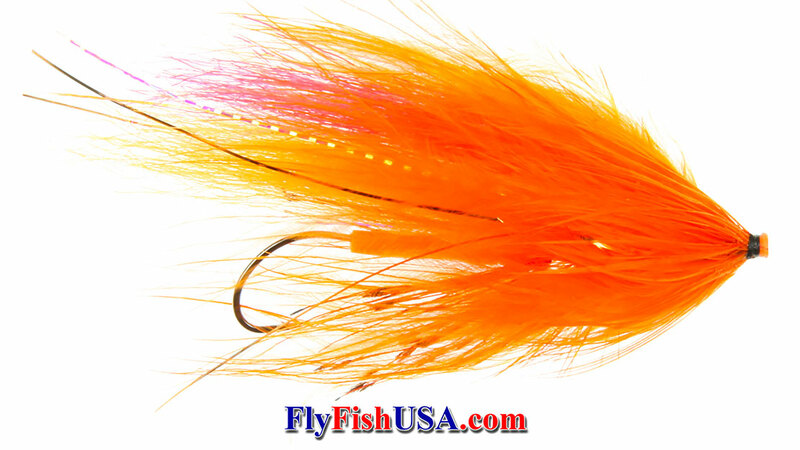 Even very large flies constructed from marabou are easy to cast. When the water is cold, large flies will often move fish that small flies won't. Because of their mating instincts, winter steelhead, especially the males, can be territorial and will attack a fly to drive it from their hold. 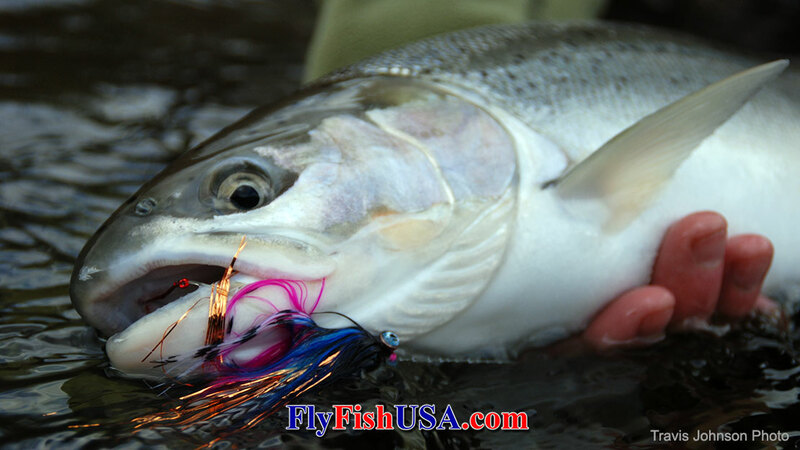 Large flies dressed in steelhead spawning colors can bring jolting strikes. 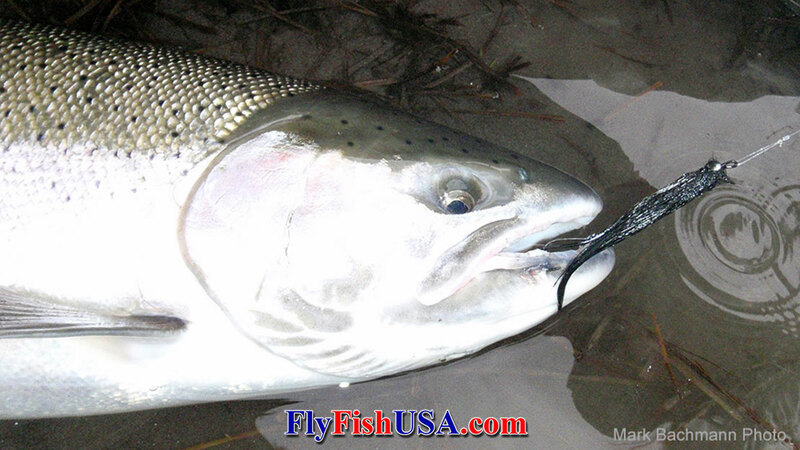 Fresh steelhead have an acute search image of the marine organisms that nurtured them. Flies dressed in the form of squid, shrimp or krill can trigger a feeding response. In most cases your fly must be presented to fish that are holding fairly close to the bottom of the river. Sometimes these holding areas are deep with a cover of fast water. This condition most often happens when the water is low and clear. 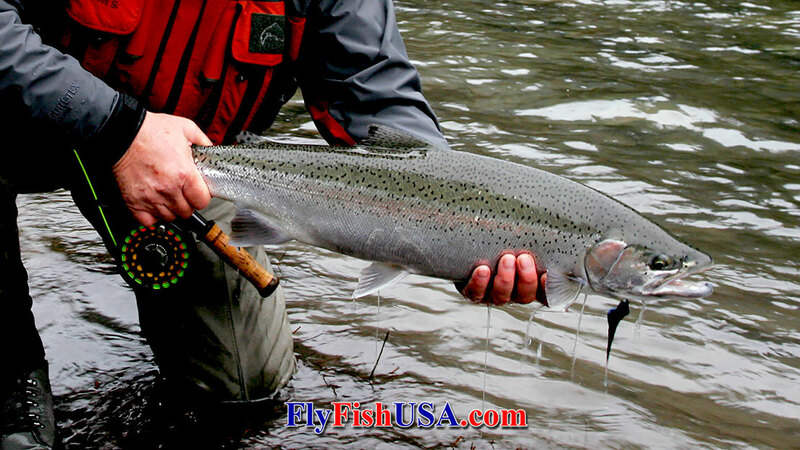 When the water is high and colored, steelhead often hold in slower edge-water. For that reason, an angler should carry a selection of flies that are not only different colors, but also different weights. Many seasoned anglers carry flies that have large weighted eyes, medium weighted eyes and no eyes. Our fly inventory reveales that our customers are onto the game.The seven winter steelhead fly patterns and sizes listed below are top sellers. They run the gambit of sizes, colors and weights, and come very close to the selections carried by each of our professional guides. 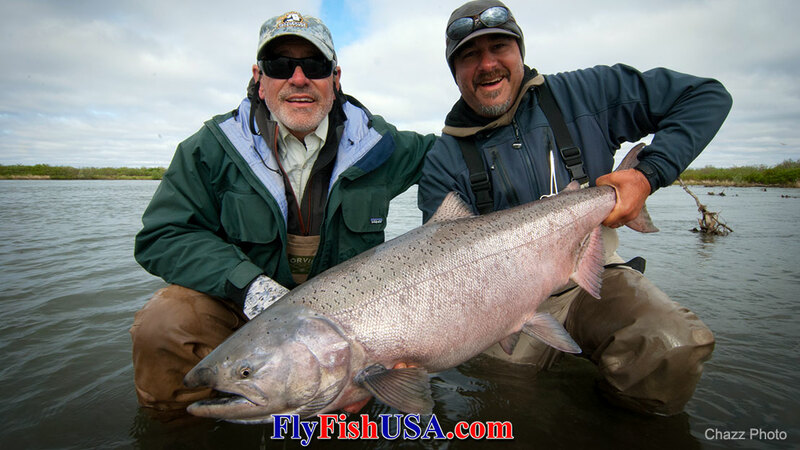 As a sport, fly fishing is the scientific exploration of the aquatic world with tools, which deliver information about game fish that no other equipment can render. Often this information is collected and the fish is released with a minimum amount of wear & tear. It survives to possibly be re-examined by someone else. Scott Howell, inventor of the Guide Intruder series says, "My years fishing in BC also made me a strong believer in the color pink. I had too many fish pulled out behind me by friends fishing the notorious pink worm to not be an advocate of pink. As a result, there was a time when a pink Guide Intruder was about all I fished in BC unless colored water forced me to go darker. As I look back at the photo albums from my time spent up north, it is no coincidence that just about every fish has a pink mop hanging from its jaws. 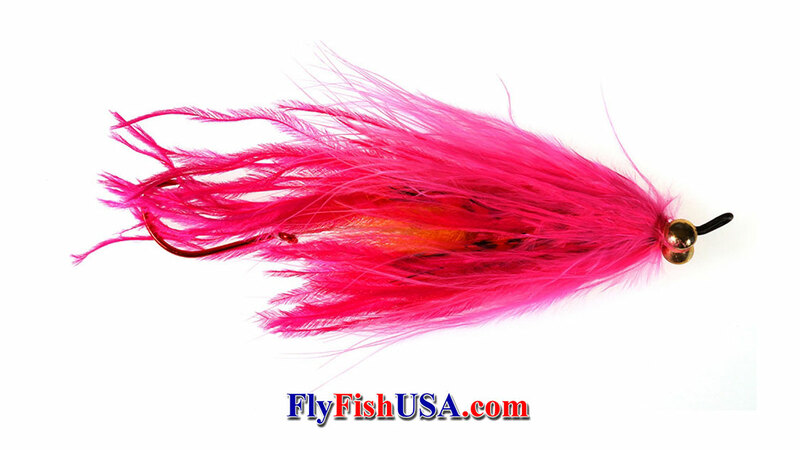 I have since found pink to be productive on most steelhead rivers up and down the coast." Every angler goes through an evolution. I have fly fished since early childhood. My first dozen winter steelhead were caught with flies on a fly rod. My first successful winter steelhead flies were all bright colored, and very small. As more time was spent fishing for winter steelhead, my flies grew in size, but were still tied in mostly orange or pink. Then I met an angler while he was landing a dandy fish on one of George Cook's Blue Moon flies. Several years ago Bruce Berry introduced us to an OPB program, which was shot with and underwater camera that was anchored to the streambed, that documented steelhead spawning with several small male rainbow trout. the large male steelhead spent a lot of time in territorial disputes trying to drive each other from the spawining area. Each time the female steelhead were left unattended, one or several of the small male rainbows would sneak in and service the the spawning female steelhead. Hen the larger male steelhead would return to the females the smaller trout would seek the margins, but one was too slow and a male steelhead bit and killed him. Several local fly tiers experimented with patters to see if they could exploit this competition beween steelhead and resident trout. This mid-weight, mid-size fly series (8-colors) has proven to be productive on steelhead year around. More than a few spring Chinooks have eaten them also. Black/Red, Black/Blue kind of bridges the gap between dark flies and bright flies, and are proven in both bright light and darker conditions. Olive is a sleeper color all times of the year. 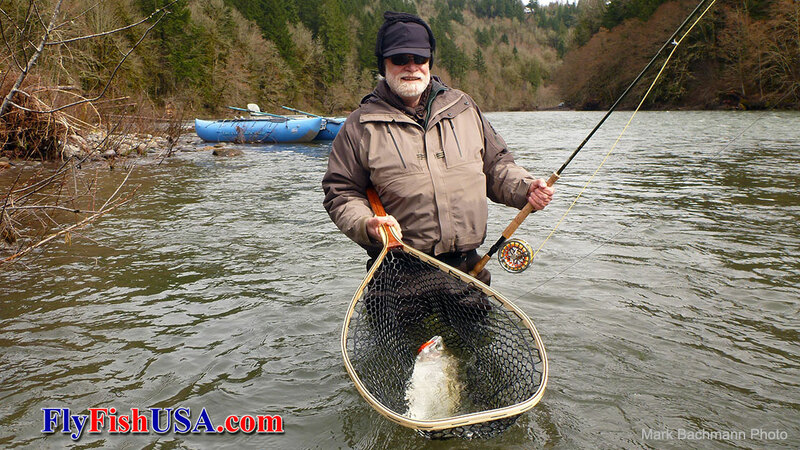 Southern Oregon fishing guide, Scott Howell originated this series over a period of years, and tested these patterns in Alaska, Canada and the Pacific Northwest of USA. 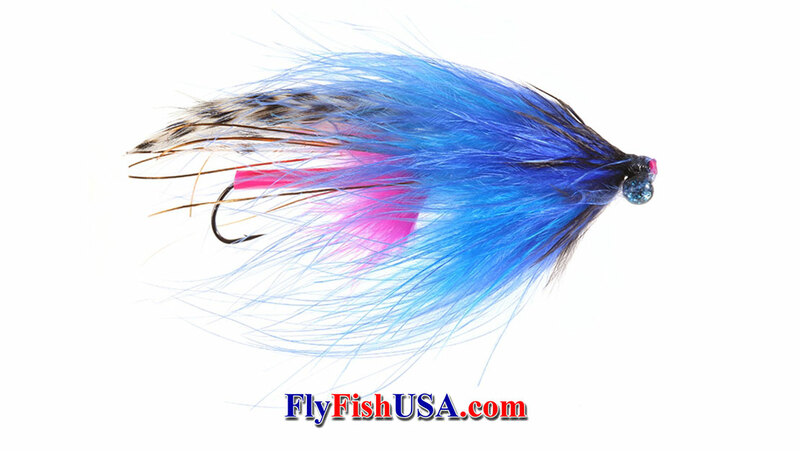 Berry’s Fish Mover is an effective fly for Steelhead that is offered in two color ways. Orange…which is a fade of Orange, Red, Purple and Black designed originally for fish fresh into a system and Blue…which is a fade of Kingfisher, Royal, Navy and Black designed as an anytime versatility color. The name came from lurking around different fly fishing sites and reading about fisherman who would say anything except, “we did not catch anything today”. “Moved a couple and had a head shaker” or “Moved three fish, landed a trout and had a couple other suspicious pulls”. It all means they had the chance to spend some time on the river and most likely without a cell phone, but, as fisherman, we rarely come clean and fish that did get caught can often go from five to seven pounds from the boat ramp to the driveway. Being a fly-fisherman who chases anadromous fish means you are going to have o.k. days, great days, skunk days and periods of time measured in days without a pull, take, tug, tick, stall or anything that makes one wonder if they are casting downstream to far…not far enough…mending too much…not mending enough…tippet too long…tip too heavy…not heavy enough…that is just the way it is! 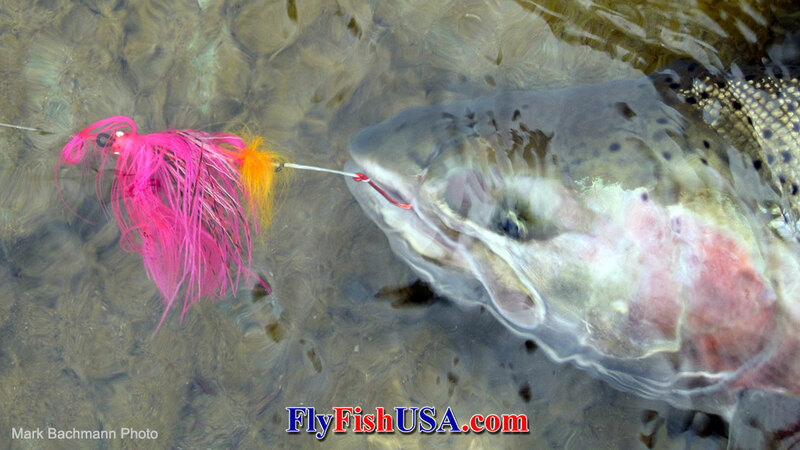 The Fish Mover design came from a visit to Thailand to help train tyers specifically on Steelhead fly proportions. Once a bunch of Rhea quality Ostrich was seen in the factory that nobody knew what to do with, “I had to create a fly with that stuff” said Bruce Berry of Montana Fly Company. 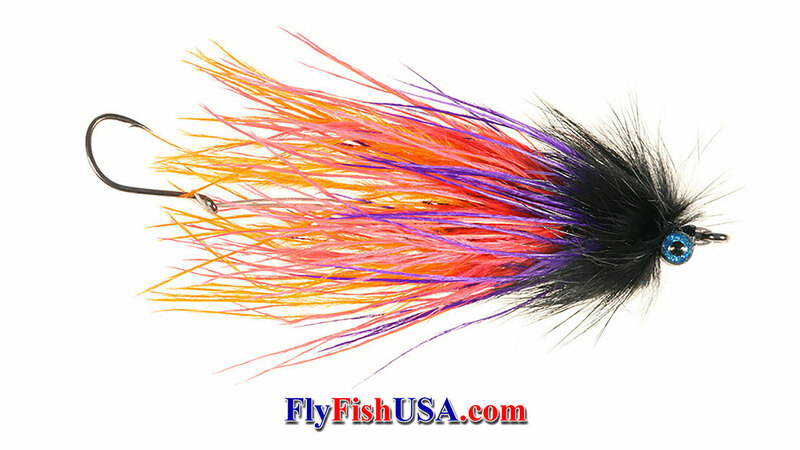 The fluffy stuff is what Trout tyers are looking for to create bugs like Ray Charles etc. the skinny stuff is what Steelheaders are after. The Fish Mover is a repeating process of Krystal Chenille balls, Strung Saddle Hackle and Ostrich capped with a rabbit (off the leather in a dubbing loop) collar. That way, the same length Ostrich can be used and is spaced out between the chenille balls/hackle ultimately keeping the fly from clumping when it gets wet allowing the movement of breathing and pulsing that makes the Fish Mover look alive and tantalizing in the water. 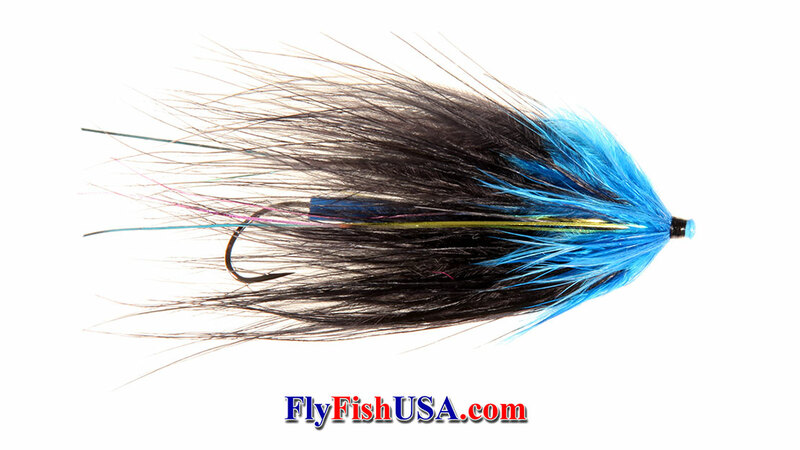 This fly is on a shank, extended with wire and finished with medium dumbbell sparkle eyes, so it may not be a rabbit strip tail combined with cross-cut rabbit, flash, dumbbell eyed combination wet sock of a fly to cast, but there are other flies definitely easier to cast if distance is key or fishing tight to the bank means more hooked fish. Originally the fly was designed for middle of the road water conditions from some visibility to fairly good visibility. These conditions often find fish in classic tanks where losing flies is not really an issue or 35’-60’ casts where the slot being fished is “x” amount wide and “y” amount long and you want the fly to land, sink quickly and start fishing immediately. 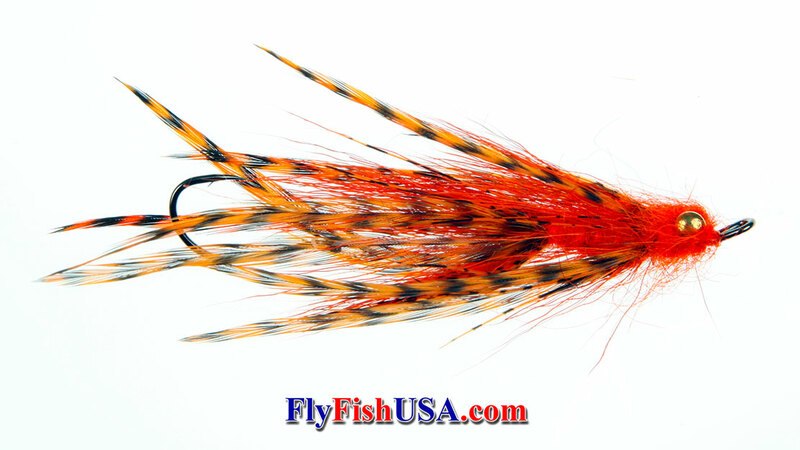 Charles St. Pierre designed the Foxee Dog anadromous fish fly series using traditional, proven proportions, but used the latest materials and tying techniques. Following the lines of the famous Nordic Atlantic Salmon Temple Dog Series, the Foxee Dog Series is tied on Waddington Shanks rather than tubes. This places the hook back further toward the rear of the fly, because Pacific Coast fish often grab from the rear of the fly. Brian Kite, inventor of the Pick Yer' Pocket series of flies has guided in Alaska and Northern Washington. 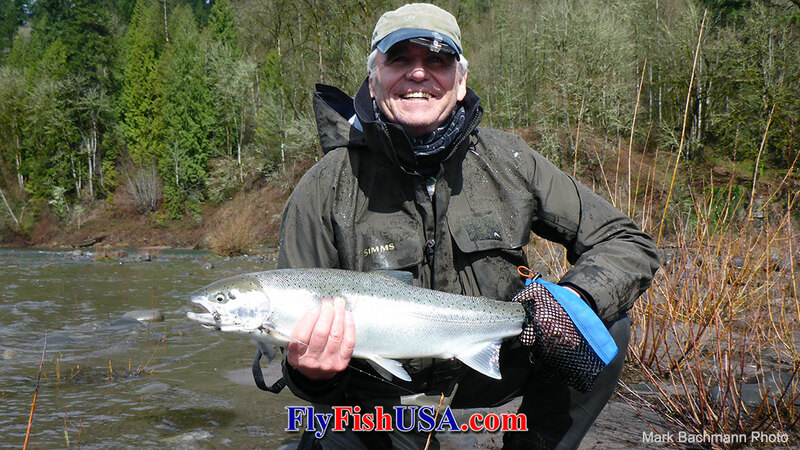 He says, "My steelhead roots have strong ties to the Skagit Style of fishing; short shooting heads and big flies. The Pick-Yer-Pocket was developed and some what plagiarized from the now famous ‘Intruder’ style of flies originated in the region. We have been tying these flies for years, often experimenting with different types of materials in search of the ‘perfect swim’. A major challenge with big flies is the difficult marriage between size versus weight, i.e., the bigger the fly, the heavier it is causing a lot of grief on the river when casting. The great thing about the Pick-Yer-Pocket is that it carries a big presence in the water, gets down deep but does not carry a lot of weight resistance when casting. 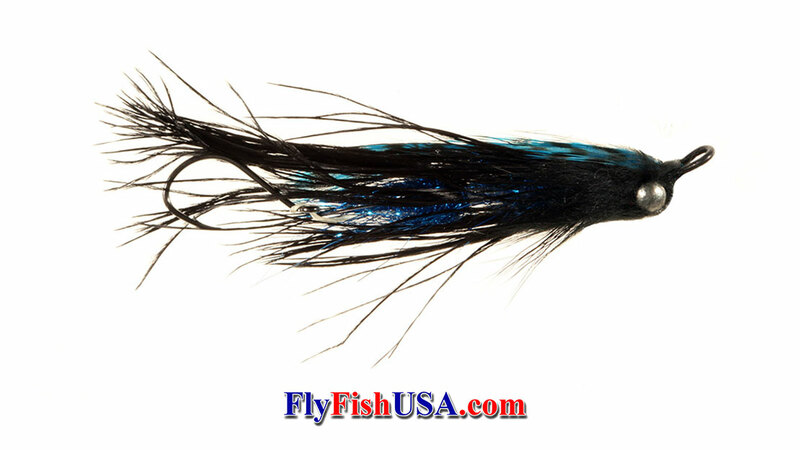 The segmentation of the rear and front sections of the fly separated by the body gives the fly a different look through out the swing, and the use of the long saddles and Amherst pheasant tail feather fibers establish that tasty silhouette in the water. Pick-Yer-Pockets come in six different colors for different water conditions, and for all the salmons, sea run browns and steelhead. In this series the most popular color is orange, with pink a close second, and black very popular also. 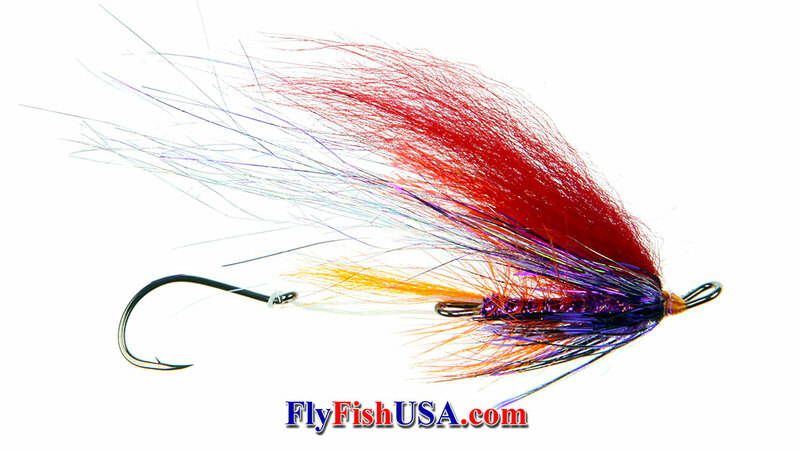 Fish these flies with classic swing methods. Flies of this nature cast easier with two-hand rods than single hand rods. As long as you are making nice straight casts and controlling the swing speed, the fly will do all of the work. The machined brass eyes incorporated in these patterns give them the sink rate to be effective in most current speeds and depths. A key to making this fly demand attention in the water is the exact placement of the various layers of life breathing materials.. Over dressing the fly will cause materials to mat together and not swim properly, the key with this style of fly is allowing the sparsely tied materials do the work in the water. These flies have a definite squid-like look in the water. 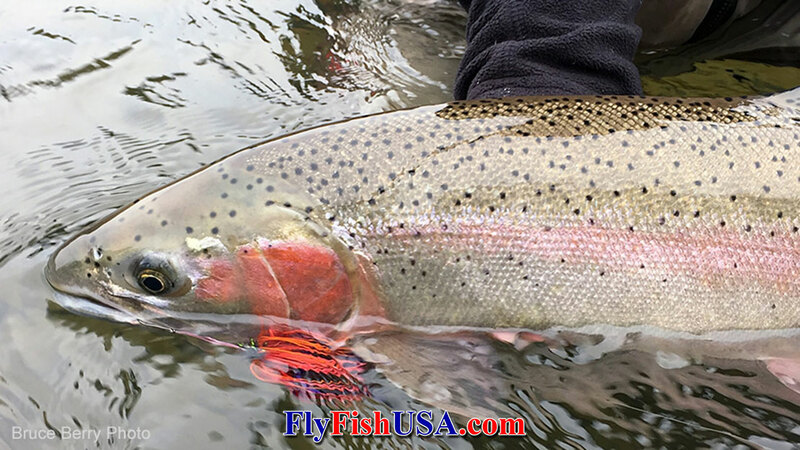 The Pick-Yer-Pocket is a great fly for year round steelhead fishing, and like the name suggests, you can feel confident fishing it behind someone in the river! !